The proven solution for high–capacity, vertical elevation or loweration of food products within the food environment. The Nerak food spiral elevator is the ideal solution where a continuous process for the vertical elevation or loweration of boxes, cartons or food products is required. The belt is very open and easy to clean and the materials are all food approved. The flexible set-up enables clients to configure the Nerak spiral solution to suit their specific conveying needs. This is particularly useful where the product needs to be turned through 90 degrees during elevation, avoiding the need for expensive cross transfer conveyors. 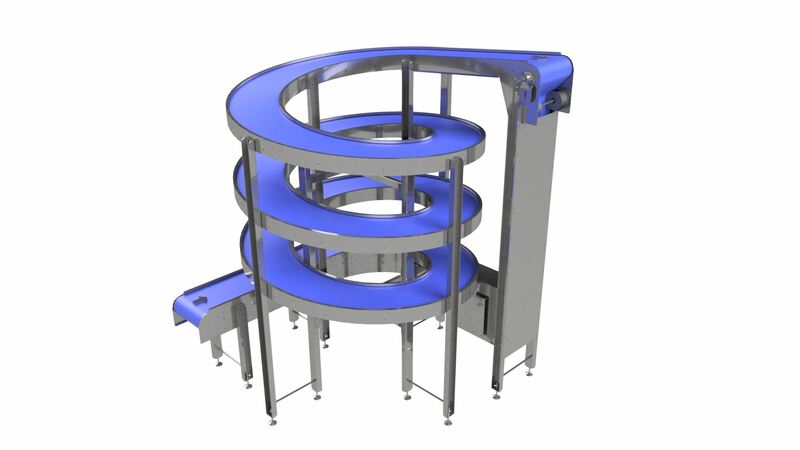 The Nerak spiral elevator for food industries has a side driven modular belt. The friction coefficient is reduced to a minimum by using guide bearings at the side. The belt is very open and easy to clean and all materials are food approved. To prevent wear during heavy-duty use the Nerak food spiral elevator uses belt panels made from POM (Polyoxymethylene). The excellent wear resistance is perfect for transporting products. Careful design and component selection ensure quiet operation, low maintenance and long life. The Nerak spiral elevator is available with a variety of belt widths and with a capability of moving up to 3,000 units per hour. The Nerak food spiral needs only one drive. The drive is connected to the belt with a strong stainless steel chain. The roller support and guide bearings minimize belt friction and reduce energy consumption. Only one motor is required which in turn minimises operating cost..